Aliens have invaded Earth. They've strategically wiped out much of the planet's formalized defenses, often doing so with such speed and efficiency that no one even had a chance to respond. These creatures somewhat resemble the griffins of ancient mythology, and a reporter nicknames them Griffs just before the major communication channels are wiped out. Christopher Moore and Ian Corson's The Griff (with art by Jennyson Rosero) picks up here and follows the story of a few survivors, trying to get the now-crashed mothership. The broad strokes are ones you're likely somewhat familiar with. Most of the story is one of survival with unlikely allies against the common alien threat. There's some nice twists to the story, though, to keep things interesting. The Airborne Sergeant isn't exactly who he appears to be and some of the main characters do end up getting killed when you don't expect it, for examples. A pretty decent story is in there. That said, though, there were several sequences that didn't make any sense. Not because the story itself was bad or had plot holes or anything, but it was just exceptionally difficult to parse out what was actually going on with the art. There are sequences which I read through multiple times, and still couldn't understand what was happening. "So, he grabbed... something? And now they're in a different room?" Seriously, I thought that during two completely different sequences. Now, that could happen for any of several reasons. Maybe the writers provided odd or poorly structured page breakdowns -- this is their first graphic novel, after all. Maybe there were some communication problems from one side or another. Maybe the artist just did a bad job. You can't tell for certain just by looking at the finished page. There were some other sequences that made sense, but kind of came out of nowhere. Like when Liz miraculously turns up with some SCUBA gear that had never been shown or mentioned previously. Or when Curt takes his shirt off to put some bandages on his arm, only to have them disappear on the next page. And there were some consistency issues as well. Oscar's head is shaped differently from scene to scene, and he seems to change height a few times as well. The speed boat Steve finds radically changes its design from a long, narrow bow to a medium length one to an extremely short and stunted one over the course of a few pages. Given these types of issues, I'm inclined to think the biggest issue with the book is the artist. She's not a bad illustrator at all, and many individual pages are quite well drawn in fact. But the storytelling seems fairly weak throughout the book. Maybe it's something a stronger editor could've caught and helped correct, or maybe another round of reviews by the writers could've added some clarifications in the text. It's not so bad that you can't squeeze out a decent story, but I think the reader has to meet the artist more than halfway here. 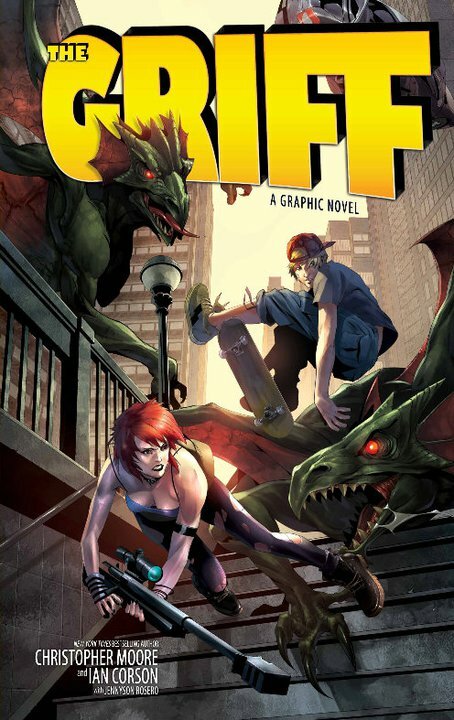 The Griff retails for $22.99 and has a July 19 street date. I was provided with an advance review copy of the book from the publisher.